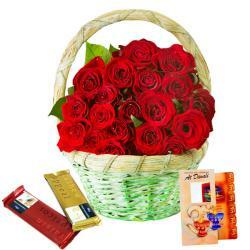 Product Consist : Diwali Greeting Card, 16 Pcs Ferrero Rocher chocolate Box along with Bouquet of 50 Mix colorful Roses. 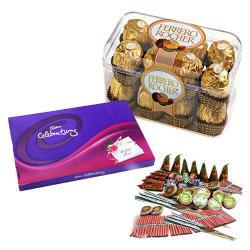 Treat your friends with this special gift combo this diwali. 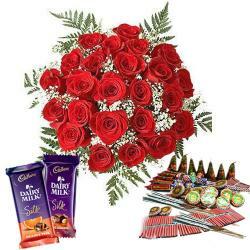 The combo has a bouquet of 50 mix roses, 16 Pcs of Ferrero Rocher chocolate, diwali greeting card. 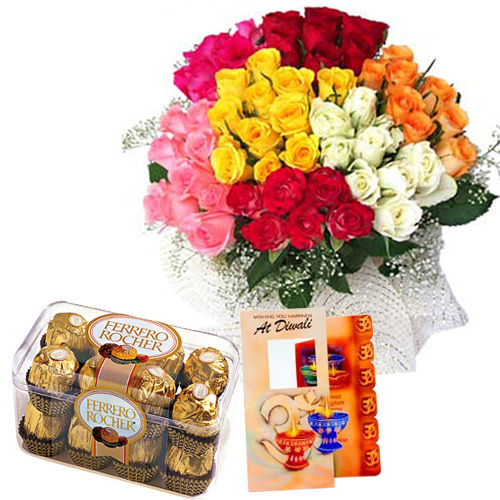 The bouquet of flowers is very beautiful which will fill their life with its charismatic aroma and freshness. The varied varieties of chocolate will mix sweetness in their life and card beautifully will inspire them to shine like it. This will be a perfect gift for your friends this diwali when you visit them. 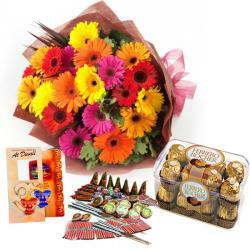 Product Includes : Diwali Greeting Card, 16 Pcs Ferrero Rocher chocolate Box along with Bouquet of 50 Mix colorful Roses.